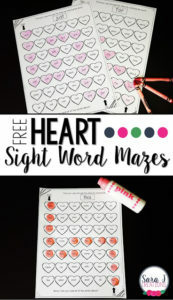 These heart sight word mazes are a great way to practice sight words in February and around Valentine’s Day. But the fun doesn’t have to stop there – you could really use hearts all year long! Just have students color or use bingo markers or you could laminate and reuse the mazes.